Posted on December 12, 2014 by Will R.
This past weekend, I got a chance to see Big Hero 6, a Disney movie about a 13 year old robotics prodigy named Hiro, who, after his brother, Tadashi, dies in a freak accident, is left with Tadashi’s health care robot, Baymax. After Hiro’s microbots (little robots) are stolen, and it is discovered that they are being used to do evil, Hiro and Baymax, with the help of Tadashi’s college friends, set out to find the man responsible for Tadashi’s death and the microbots’ evil escapades. At first, Big Hero 6 may seem like a basic kid’s movie- a battle between good and evil. However, Big Hero 6 carries some more subtle, deeper messages. One of the themes of the movie is the message of the power of friendship. Big Hero 6 shows that by working together, even the biggest of problems can be solved. The movie also leans away from gender bias. Two of Tadashi’s friends are girls, and they are equally important and smart as the boys in the movie. 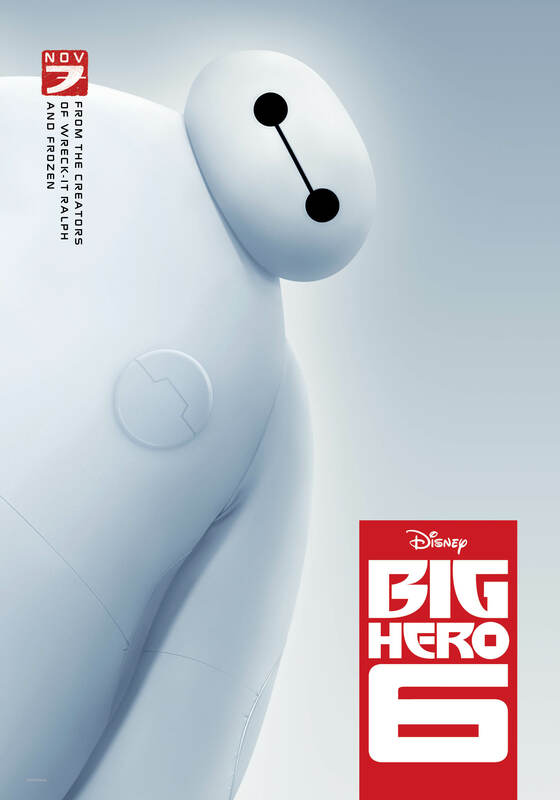 Big Hero 6 also sets up a diverse cast of characters, characters of different races and from different backgrounds. Big Hero 6 shows that decisions made in the quest for revenge and in anger are never good. When Hiro tries to get revenge from the man who killed Tadashi by taking out Baymax’s health care chip and leaving in his fighting chip, things go wrong. The movie also supports the idea of innovation and robotics, two things that can help society. The main message in the movie is that those who are loved can always be remembered. When Tadashi dies, Hiro does not think this way. However, Baymax shows him that loved ones can always be remembered. This causes Hiro to think differently about things. This movie is great for people of all ages, go see it as soon as possible. The Moomintroll series, by Tove Jansson. Although these books may be hard to find, the Moomintrolls have the same kind of cuddly appearance and personality as Baymax. Alex Rider series, by Anthony Horowitz. Just like Big Hero 6, these book are packed full of action and adventure. This entry was posted in Movies & Multimedia and tagged movie by Will R.. Bookmark the permalink. I have seen the movie and it was a great one!! Wow! Great Review! I’m really excited to watch this movie now!